Ionesco's absurdist farce takes place in a sleepy French provincial town where a rhinoceros suddenly rampages through the market place. Over the next few days, more rhinos start appearing, until the villagers realise they are themselves turning into the loud animals terrifying the town. The drunkard Bérenger, however, refuses to transform. This new Scottish/Turkish version of the play is a collaboration between Edinburgh's Royal Lyceum Theatre and the radical Turkish company DOT Theatre of Istanbul. Rhinoceros starts as a comedy, with Bérenger (Robert Jack) and his friend Jean (Steven McNicoll) bickering in the town square. There are perfectly timed elements of slapstick, with chairs getting pulled from beneath actors, and well-placed self-referential hints at the Edinburgh International Festival. But soon the play turns into a tragedy, with an atmosphere of creeping anxiety taking over. As Bérenger witnesses his friends' metamorphosis and desperately attempts to avoid the beasts, the stage becomes narrower and more chaotic, with chairs suspended in the air, dust and flying papers filling the space. 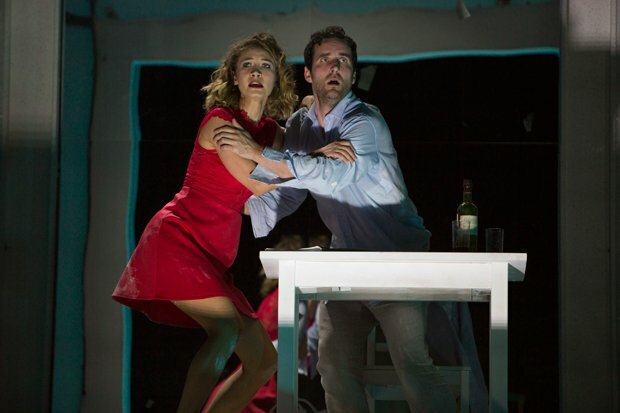 Rhinoceros is a classic example of absurd theatre with its circular dialogue and characters trapped in frustrating situations, while presenting an intense discussion on logic and totalitarianism. The conformist citizens turning into rhinos works as a parable of creeping fascist and nationalist ideas, informed by Ionesco's witnessing the rise of Nazism and anti-Semitic movements. Zinnie Harris's adaptation makes the most of the play's sharp, humorous writing and astutely shows that Ionesco's message is now as relevant as ever; the character Papillon, for instance, is made to look like Hitler, and the characters drop piercing political insights throughout. The diverse cast is excellent and their energy contagious, with Jack and McNicoll's performances particularly memorable. The final result is an elegant production, as entertaining as it is powerful. Lyceum, until 12 Aug, 7.30pm, £15–£32. Zinnie Harris' new version of Eugène Ionesco’s classic 1959 play.